Chen Jining, President of Tsinghua University, during a public event earlier this month in Beijing. By Xu Nan, Deputy Editor in the Beijing office of chinadialogue, where this article was first published. The elevation of the president of China's most prestigious university to the job of government minister was unexpected. It is rare to bring in an academic without a goverment background. But given the tarnished reputation of a ministry that is widely viewed as having failed, the move makes sense. 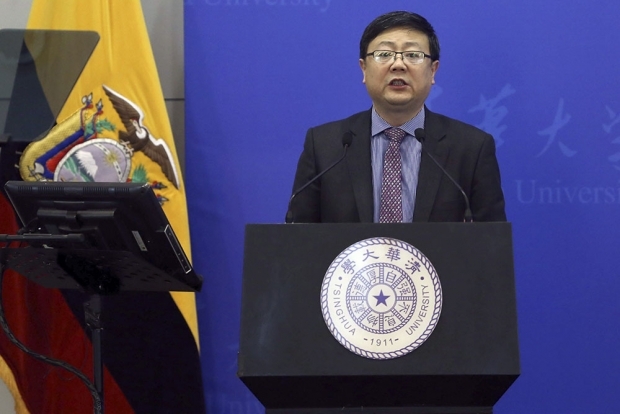 Unusually, the announcement of Tsinghua University President Chen Jining’s appointment as Minister of Environmental Protection (MEP) barely mentioned his 65-year-old predecessor, Zhou Shengxian, who had held the post for a decade. This break with convention is less surprising than it first seems. Zhou presided over high profile environmental disasters that became an increasing source of public discontent, and of discomfort to the Communist Party leadership. Large numbers of Party cadres censured the MEP at the annual March meeting of the National People's Congress (NPC), often referred to in Western media as "a rubber stamp parliament" for its lack of controversy, and the parallel session of the Chinese People's Political Consultative Conference (CPPCC). Such public censure is extremely rare. Worse, it happened two years in a row. In March 2013, a vote on appointments to the NPC’s Environment and Resources Protection Committee saw 850 votes against, 120 abstentions, and 1,969 in favor. The result prompted gasps of surprise and applause from delegates. In 2014, delegates requested the MEP make an annual report to the NPC and CPPCC that they could vote on. These events underscored both the depth of China’s pollution crisis and that public willingness to accept environmental problems was at a breaking point. Such dissent had never been seen before, even on other matters of public anger such as house prices, healthcare, and education. After these events, the change in the ministry's leadership came as no surprise. But why has Chen Jining been chosen? Despite his professional and technical knowledge, it may be more worthwhile to note a personal connection. Chen Xi, Deputy Director of the influential Party Organization Department that oversees appointments, was Tsinghua University's Party Secretary from 2002 to 2009. He is also a chemistry alumnus, who studied there from 1975 to 1979. Xi Jinping also studied chemistry at Tsinghua during that same five-year period. It is possible we will see more rising stars from Tsinghua. Chen has only a few weeks to prepare before he steps into his new role after the NPC's March meeting. He will face daunting challenges, such as how to translate the leadership’s priorities for "sustainable growth" into real improvements to the dire quality of China’s air, soil, and water. Chen’s former teacher, Professor Wang Zhansheng of Tsinghua’s School of Environmental Sciences and Engineering, told the Beijing newspaper The Paper that he hoped his former student could bring together various interest groups and face down pressure. Despite Chen’s academic background, he has practical experience in solving a wide range of environmental problems, dealing with government ministries, and encouraging new business solutions. Chen may be better qualified than many academics to head the MEP. Despite his lack of a governmental experience, he has strong professional and technical networks. He is a member of the National Environmental Advisory Commission, Deputy Chairman of the MEP’s Science and Technology Committee, and Vice President of the Chinese Society for Environmental Sciences. Even so, his appointment carries risks. Chen is a political newcomer, with little experience of officialdom other than at Tsinghua, where he was in charge for less than three years. At Tsinghua, he is often seen on campus standing by his bicycle to stop and chat with other teachers. But at the ministry, life will be less cosy. Political battles will become the norm in his new job, where he must balance complex webs of interests and relationships between local governments, other ministries, and big state-owned firms. However, Chen's lack of governmental experience could be an advantage in the midst of an anti-corruption crusade unprecedented since the founding of the People’s Republic. Between the 18th Party Congress in 2012 and the end of last year, 55 officials at provincial-ministerial level have been caught in the anti-corruption clampdown. An average of two a month have been placed under investigation. The current leadership’s prime concern now is to rebuild that political structure, but this task is complicated when many potential candidates have links to officials under suspicion. It creates a dilemma for those doing the top-level hiring and firing. The last two decades have have seen a number of university presidents elevated to high office. Zhou Ji was President of Huazhong University of Science and Technology when he was promoted to Minister of Education. More unusually, two ministers have even been chosen from outside the Communist Party for their strong technocratic skills. Wan Gang, Minister of Science and Technology, is an ex-president of Tongji University who has worked for German carmaker Audi. The sensitive post of Minister of Health is held by Chen Zhu, an internationally renowned hematologist and stem cell scientist. Chen takes on his new job amid major challenges, as China tries to face down a full-scale environmental crisis.